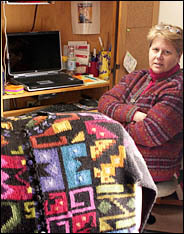 Caption: L. A. Adams provides online assistance to Cochiraya, Peru, designing elements of the village's textile marketing campaign. Photo: Suzy Allman for The New York Times. THE villagers of Cochiraya in southern Peru have been harvesting alpaca fleece since before the Incas arrived. But the fiber now generates meager returns on the local market, and most of Cochiraya's young people move to distant cities in search of other work. Since July, however, volunteers have banded together to help Cochiraya sell its alpaca textiles to the world. They have offered advice on how to set up and maintain an e-commerce site, arrange for international payments, draft a business plan and even choose a logo. Cochiraya is one of about 50 villages participating in a virtual aid network known as Nabuur, a Dutch nongovernmental organization that was begun in 2001 and is based in Giethoorn. Nabuur strives to be an anti-hierarchical, self-organizing, open-source network whose volunteers help people in the developing world directly, based on what those people ask of them. "I'm interested in a new organizational concept," said Nabuur's founder, Siegfried Woldhek, "where a local community calls the shots" in determining the advice or assistance they want. As for the volunteers, Mr. Woldhek said: "People want to connect more directly to a cause, but the institutional forms that exist can't let them in. They would like to, but they don't know how." The Internet "has now made it thinkable to connect hundreds of thousands of places, directly, to millions of people," he added. "But we don't have the systems to help hundreds of millions of people, and that is the sort of scale we need to look at." By embracing the open-source concept (other popular examples of which include the Linux operating system, the Firefox browser, and Wikipedia, an online encyclopedia), Mr. Woldhek, who previously directed the Dutch branch of the World Wildlife Fund, hopes Nabuur will eventually take on the self-organizing characteristics of a real neighborhood, eliminating the need for a central controller. (The organization's name, he pointed out, is an old Dutch word for neighbor). Each new Nabuur village gets help establishing an Internet connection, often through a satellite phone link, either in the village or in a specially equipped jeep that makes local rounds. Mr. Woldhek said that in some areas, villagers will walk to a neighboring village once a week to reach a phone line. Villagers appoint representatives to communicate with Nabuur's virtual volunteers, on projects like how to start a youth computer-training center, improve local water quality or better integrate the village's disabled people. The assumption is that small communities can carry out many public-works projects by themselves if provided with the right information. Though its aims may be grander than most, Nabuur is not alone in promoting virtual volunteerism. The United Nations Volunteers program, in Bonn, maintains a database of volunteer organizations, currently 600 strong, at onlinevolunteering.org. The organizations offer online aid opportunities to the site's community of roughly 29,000 registered volunteers. Among them are civil engineers, college students, organic farmers and retired homemakers, whose contributions range from technical and grant-writing expertise to letters of recommendation and Web design. While the volunteers used to be primarily North American and European, Jayne Cravens, an online specialist with the United Nations program, said that now almost 40 percent of the people who have signed up come from developing countries, including Nigeria, India, Ghana, Pakistan and Egypt. The Indian Ocean tsunami last month led to a pronounced increase in interest, Ms. Cravens said. But she said she had already noticed "the numbers are really going though the roof." "A lot of organizations are realizing they've got a huge untapped resource out here," she said. So employees can be out in the field more while the online volunteers "can be putting together data, graphics, a Flash presentation, translating a document - and doing it happily." 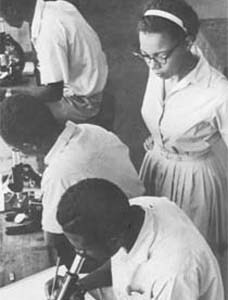 One such enthusiastic volunteer is L. A. Adams, a Peace Corps veteran who works as an international student adviser at a New York college. Ms. Adams provides online assistance to the village of Cochiraya, designing logos and other elements of their marketing campaign. As one of Nabuur's roughly 1,300 "neighbors," Ms. Adams said she was attracted to how the agency allows for direct contact with the local people, instead of through an intermediary. "It's very rewarding in a way I never thought was possible virtually," she said. "It's just sort of like my Peace Corps experience, but I can sit in my own house." "I come home and the first thing I want to do is log on. I sit behind a computer most of the day, so that's peculiar," she said, adding that she usually puts in more than the recommended 6 to 10 hours per week. "So obviously I'm liking it." Another participant, Dennis Argall, a retired Australian diplomat who was ambassador to China in the mid-1980's, said he also gladly logs extra hours lending his diplomatic expertise to a number of Nabuur's virtual villages. One project, for example, involves investigating how residents of Amlan in the Philippines can make money by removing the local overgrowth of cogon grass (a weed that frequently spreads where forests have disappeared), transforming it into artisanal paper products and then devoting the regained land to sustainable forestry. Mr. Argall said he relishes the "opportunity for people to deal with each other on the merits of what they can do, rather than labels like rank or title." The eagerness of highly-qualified online volunteers like these, said Ms. Cravens of the United Nations, makes them increasingly valuable to aid organizations. "Their first impulse is, wow, free labor," she said. "But this goes way beyond that." Though the results so far have been modest, Mr. Woldhek says everything has gone according to plan during the first three years of Nabuur's existence. He said that he expects to have as many as 400 villages participating in the program by the end of this year. "We've been deliberately very slow not to add too many communities at this point, because what needs to be done first is to test the idea," he said, "Is this pie in the sky, or is it indeed possible that strangers from around the world will get together on the Internet to do something about a place they care for?" Nabuur's pace doesn't discourage Mr. Argall, the former Australian diplomat. "We're in at the ground floor of something that can be enormously important," he said. "I don't know whether it's going to succeed. It can fail, but I think the world will be a much better place if it doesn't fail."